The United Nations Human Development Index is the world’s all-purpose national scorecard, a single number that represents a country’s success at providing a decent life for its people. But according to a Mongolian ecologist who feels his own country has been led astray, it’s time to update the HDI with a critically missing component: sustainability. “My country is likely to become one of the fastest growing economies in the world, but the current HDI offers no encouragement for it to grow sustainably,” wrote Chuluun Togtokh of the National University of Mongolia in a Nov. 16 Nature essay. Togtokh presents an alternative ranking system, one that adds per-capita carbon emissions to the Human Development Index’s standard factors of life expectancy, adult literacy and per-capita purchasing power. Carbon emissions are a shorthand for sustainability; though they tend to be linked with income, countries like Norway and Singapore show that high fuel consumption isn’t absolutely necessary for prosperity, and there’s no correlation between fuel consumption and health or education. When the carbon footprint is added, the Human Development Index is thrown into disarray. Australia, the United States and Canada all drop from the top 10. 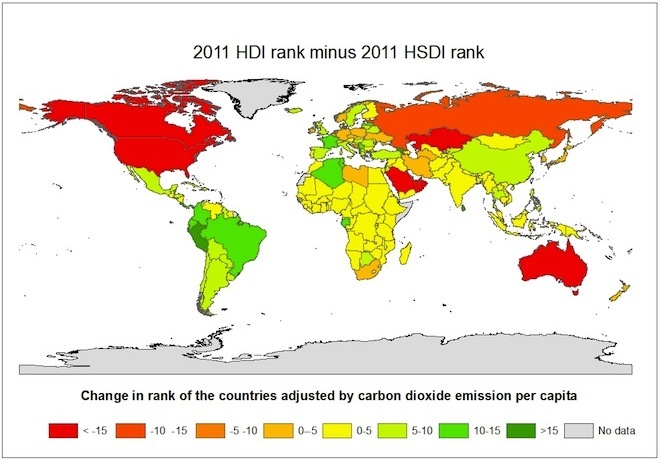 The United Arab Emirates, Brunei, Qatar and Bahrain — all countries that score high on the standard HDI — also fall. 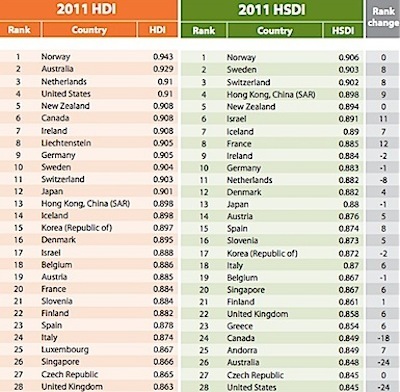 Rising are Hong Kong, Sweden and Switzerland, while Norway stays on top. “Anyone who has visited the Nordic countries will recognize that moderation need not compromise a high standard of living,” wrote Togtokh. Like any system that puts a numerical score on complex social and economical circumstances, the Human Development Index has been criticized for oversimplification. Togtokh’s system, which he calls the Human Sustainable Development Index, is no different, and it’s certainly possible to be carbon-responsible but overpolluting in other ways. But at least it’s a start.